36mm 18K white gold case, fluted bezel, blue dial, index hour markers, calibre 3155 self-winding chronometer movement with day and date display, blue leather strap with gold deployable clasp. Waterproof to 100 meters. 36mm 18K white gold case, fluted bezel, cherry dial, index hour markers, calibre 3155 self-winding chronometer movement with day and date display, cherry leather strap with gold deployable clasp. Waterproof to 100 meters. 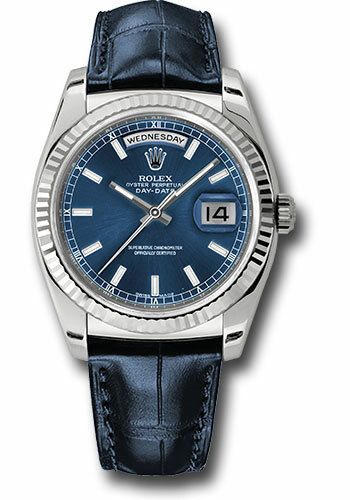 36mm 18K white gold case, screw-down crown, fluted bezel, silver dial, index hour markers, Rolex calibre 3155 automatic movement with instantaneous date and day windows, approximately 48 hours of power reserve, blue leather strap, folding buckle. Waterproof to 100 meters. 36mm 18K white gold case, screw-down crown, fluted bezel, silver dial, index hour markers, Rolex calibre 3155 automatic movement with instantaneous date and day windows, approximately 48 hours of power reserve, brown leather strap, folding buckle. Waterproof to 100 meters.